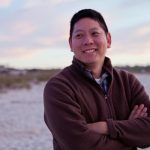 On February 28, 2017, 300+ people gathered at UC Davis for the annual CalCAN (California Climate and Agriculture Network) conference. 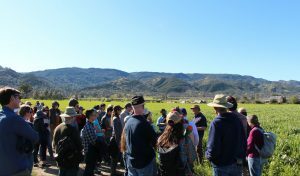 Farmers and ranchers, government and nonprofit agencies, policy advocates and funders gathered to learn, share best practices, and problem solve around agriculture and climate change. I had never been to the CalCAN Summit before, but came away blown away by the quality of people and conversation, and the deep intersection of our work supporting the economic viability of sustainable small farms and ranches and the work of CalCAN’s coalition and policy work supporting ecological land stewardship and climate resilience on farms. Several of the farms we support at Kitchen Table Advisors had a presence at the conference: Javier Zamora of JSM Organics was on a farmer panel in the opening plenary; Emma Torbert of Cloverleaf Farm participated in a workshop; and Alexis and Gilles Robertson of Skyelark Ranch hosted a farm tour. It was great to be in dialogue with seasoned farmers like Judith Redmond of Full Belly Farm and Albert Straus of Straus Family Creamery; nonprofit partners like POST, California FarmLink, Point Blue, and the Carbon Cycle Institute; thoughtful policy advocates like Renata Brillinger at CalCAN and Dave Runston at CAFF; and key supporters like Sallie Calhoun of Paicines Ranch; Michael Roberts and Joanna Lehrman at 11th Hour Project; Susan Clark at Gaia Fund; and Nancy Schaub of New Priorities Foundation. The day after the CalCAN Summit, 70+ people spent the day visiting three farms in the Capay Valley to walk the land, touch and feel the soil, and hear from farmers on the ground about healthy soils, agriculture and climate change, and how they understand the connection between operating an economically successful farm while stewarding their land. The first stop was at Yocha Dehe Wintun Nation Farm & Ranch, owned and operated by the Wintun Nation tribe, to hear from ranch manager Adam Cline about his efforts to raise cattle while improving soil and ecosystem health. Co-leading the tour was Corey Shake, a partner biologist with Point Blue who is part of a statewide rangeland monitoring network providing advice and doing wildlife and plant species monitoring to learn about the impacts of grazing strategies on soil health and biodiversity. and Paul Muller shared their experiments and experiences with minimizing soil disturbance, using various cover crop mixes, and rotating livestock to enhance soil organic matter and carbon sequestration. 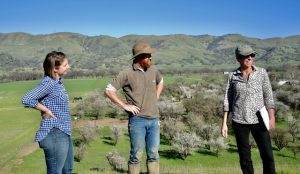 The last stop on the farm tour was with our client at Kitchen Table Advisors: Skyelark Ranch, a 40 acre pastured livestock ranch operated by Alexis and Gilles Robertson who receives business advising from our Farm Business Advisor based in Yolo County, Thomas Nelson. Alexis and Gilles are a young couple who have been farming since 2010 and sell their pastured lamb and pork through the Davis and Oakland Jack London Square farmers’ markets, and their pastured eggs to institutions like Airbnb through food hubs like Capay Valley Farm Shop. We walked under the canopy of an old almond orchard where they rotate pigs and chickens next to fields where they grow hay and graze their sheep. The focus of the conversation was, of course, around how they manage the animals and their land, and how the land stewardship practices of farms like theirs are helping fight climate change. After we walked under blue skies to the top of the hill that looks over their farm, Alexis and Gilles reminded us that this conversation about their efforts to steward the land, sequester carbon, and battle climate change has to be considered in the context of the long-term viability of their farm business and making enough of a living to support their family. They have a 1 year old daughter, Isla. And they have been working hard and fighting an uphill battle to build Skyelark Ranch to be a farm business that raises livestock in a humane way that is in balance with the land and their community, and that provides a living for their young family. It’s super clear to Alexis and Gilles that they need to have a farm that is economically viable in order to be sustainable. They need to be able to cover business expenses and investments in long-term farm infrastructure; cover their family’s living expenses; and hopefully have the chance to eventually save a little money. Because if they can’t do that, then despite their best intentions, they will not be able to continue stewarding the land in a way that is in line with their values, incorporating practices that sequester carbon, and building healthy soils. As the sun was getting low in the sky, we closed in conversation surrounded by sheep in one of their pastures. We talked about how long-term farm viability is a necessary piece of the puzzle to ecological farm land stewardship, and how farmers like Alexis and Gilles need to focus on running their farm as a business AND build a network of support. It became clear that the all of us that had come together at the CalCAN Summit, standing in a circle around Alexis and Gilles in their pasture, were part of that network: seasoned farmers who provide advice and support; groups like Capay Valley Farm Shop and Fibershed that market, aggregate and distribute their product; nonprofits like Kitchen Table Advisors and California FarmLink that provide business advising and financing; and organizations like CalCAN that advocate for policy solutions that create an environment in which farms like Skyelark Ranch can thrive. And we each rambled off into the lazy sun of the afternoon to go back to where we came from to play our part in this ecosystem.